Welcome to Kalorama Information’s Immunoassays page! You’ll find all the information you need concerning the immunoassays industry through our market research reports, blog posts, press releases, videos, and multimedia, consolidated for your convenience. This resource page consolidates Kalorama’s reporting on this important clinical diagnostics segment. And our detailed immunoassay diagnostics market research reports offer the best source for those selling into this market. Immunoassays are the workhorse of clinical laboratories and behind medical decisions made worldwide. But immunoassays can be overlooked with so many other novel testing technologies available. Immunoassays are tests based on the binding of antibodies to antigens substances (analytes). Clinical laboratory medicine has employed immunoassays to enhance diagnostics since the 1960s. Despite the long history of immunoassay IVD kits and reagents and maturity of the field, companies continue to develop new immunoassays and instrument platforms to improve assay sensitivity. New developments expanding the future potential of immunoassays include making multiplexing possible, miniaturizing platforms for point of care testing, and identifying and developing assays for novel biomarkers. Enzyme-linked immunosorbent assay (ELISA) is a test which employs antibodies and color change to identify substances. Early immunoassays were radioimmunoassays (RIAs), where labels on antibodies were radioactive molecules such as iodine-125. In this assay’s final step, the enzyme (when present) converts substrates to detectable molecules. This detection method may be colorimetric, chemiluminescent, or fluorescent, depending on the substrate used. Many modifications of basic sandwich immunoassays are possible. If analytes being measures by the assay are antibodies, technicians can capture these antibodies onto the solid phase using antigens that are non-covalently bound to solid phases. A range of ELISA modifications exist. Additionally, other methods can measure and detect analytes based on antibody/antigen interactions including lateral flow immunochromatographic assays, western blot assays, and more. Researchers and companies continue to develop technologies and innovations for immunoassays. Many radioimmunoassays have been replaced by enzyme immunoassays (EIAs) or enzyme-linked immunosorbent assays (ELISA), where the label conjugated to the second antibody is an enzyme such as horseradish peroxidase alkaline phosphatase. Radioimmunoassays are still present in test development and clinical areas for early cancer detection, growth hormone level measurement, aldosterone, 17-OH progesterone, free testosterone, SHBG, and cortisol. RIAs also diagnose conditions such as hypogonadism, hepatic cirrhosis, thryotoxicosis, hyperandrogensim, hirutism, polycystic ovarian disease, and Cushing’s Syndrome. Many immunoassays are performed on blood (serum or plasma) specimens. Physicians draw blood at the office, hospital clinic, or other locations, and send samples to laboratories for testing. Urine has a long history as a diagnostic sample. Urine-based tests are available for tests including pregnancy, ovulation, and menopause tests, as well as for sexually transmitted diseases and drugs of abuse testing. In addition, non-lateral flow tests such as POC urine analyzers and biochemical-based POC urinalysis tests have been available for many years. Saliva-based diagnostics have long enjoyed industry attention. Saliva-based POC tests are available for selected tests as HIV, alcohol, and drugs of abuse. Nucleic acids are present in saliva, and saliva samples are DNA sources for genotyping analysis. Centralized laboratories use saliva specimens for other analytes including hormones. Saliva contains proteins (including antibodies), nucleic acids, and hormones. Saliva glands produce many analytes actually found in saliva samples, into which blood can also pass. Mechanisms including passive diffusion or active transport of molecules can cause this. Analytes found in blood can also be found in saliva, generating industry interest in saliva as a diagnostic specimen. As a diagnostic specimen, saliva is noninvasive and does not require highly trained specialists to perform. Specimens are also easy to both store and transport. Saliva is an attractive test sample for diagnostics companies that are considering utilizing it for new test applications. Considerations will include test accuracy, cost effectiveness, and the outcome of research to identify and validate new biomarkers in saliva. Immunoassays are a large market, globally worth $20.8 billion. The overall market for immunoassays is highly competitive and growing slowly, but has specific areas of opportunity that will be maximized. Many of the market’s tests are mature and have been available for years or decades. Kalorama Information’s Immunoassay Markets puts the global market into perspective and profiles the many companies competing in the field of immunoassays. Significant growth opportunities in the immunoassay market may be possible through further innovations. This includes both new platforms and novel biomarkers. The attractive opportunities these innovations may make possible have attracted many diagnostics companies. Immunoassays are basic, long-standing tests existing in laboratories worldwide. Globally, prospects for market growth are good in certain geographical regions (developing countries). Facets such as economics and increased health insurance availability is fueling market growth in developing countries, making them promising market segments. Many companies are targeting these markets, including major worldwide diagnostic companies as well as smaller ones. Future testing growth in these markets will occur in existing technology (ELISA and lateral flow tests). Immunoassay innovations are expanding the market in new and emerging disease areas, noted in Immunoassay Markets. Kalorama details these innovations in immunoassays in this report, and highlights three in particular: GI and transplant management in medical condition assays, and saliva-based testing as an interesting and innovative vehicle. Industry News – Who’s Leading in Immunoassays? Leading names in immunoassays will not surprise, and leading companies often lead in IVD as well. Kalorama’s latest reporting indicates that, together, Roche, Abbott, Siemens Healthineers, Beckman Coulter, and Alere lead immunoassays, earning over 40% of the market. Kalorama’s Immunoassay Markets reports that this market share cuts accorss different disease categories, meaning some leading companies in immunoassays may not appear on our list. In recent years, Roche Diagnostics has been very aggressive, displacing Abbott as the immunoassay market leader (subject to change following Abbott’s acquisition of Alere.) Roche excels in infectious diseass and testing for women’s health, sepsis, Vitamin D, and a number of cancer markers. Other immunoassay leaders include: BioMerierux, Bio-Rad, Thermo Fisher Scientific, Radiometer, DiaSorin, Fujirebio, and Ortho Clinical. More than 100 other companies compete for immunoassay market share, while smaller players with ELISa tests serve local markets. Strong niche competitors such as Fujirebio, DiaSorin, Tosoh, Wako, Thermo Fisher Scientific, and internatial companies market their products worldwide. Other smaller companies have experienced remarkable growth, but their total revenues only contribute small portions to the total market. As the average cost per test decreases with the migration of a number of immunoassays to integrated analyzers, the market’s capacity for growth becomes constrained. Abbot, active in immunoassays since the 1980’s, has secured the second market share position of the total global immunoassay market. Abbott generated most of its IVD sales outside the U.S., but is slowly regaining ground in its home country through an effort to issue more FDA-cleared immunoassays. Abbott’s strength lies in its tests, assay systems, and its successful capture of at least 50% of the global market for infectious diseases (the largest test segment), primarily hepatitis and HIV tests. Outside the U.S., Abbott added tests for Galectin-3 assays for use in conjunction with clinical evaluation to aid in the prognosis of patients diagnosed with chronic heart failure an HbA1c test. 2.Alere, now merged with Abbott, participates in nearly all immunoassay POC test segments but has a dominating position in rapid cardiac markers, drugs of abuse, infectious disease, pregnancy and fertility testing. Beckman Coulter‘s ‘Access and Synchron’ systems provide a wide menu that is continuously enhanced with new tests. Beckman Coulter’s immunoassay menu consists of more than 60 tests for cancer detection, cardiac disease, thyroid function, reproductive endocrinology and women’s health. Beckman Coulter continues to add novel and proprietary tests from different sources including tests for: inhibin A, High Mobility Group Box 1 (septic shock), erythropoetin, inhibin A, cPAPPA (marker of plaque instability), placental growth factor (PIGF), soluble fms-like tyrosine kinase 1(sFlt-1), soluble CD40 ligand (sCD40L), preeclampsia, fertility hormones, CVD, autoimmune, inflammatory disease/ cytokines, and prenatal screening. Although the immunoassay field has mature segments, companies still develop new immunoassays and immunoassay instrument platforms to improve assay sensitivity. Innovations are designed to make multiplexing possible, to miniaturize the platforms for point of care, and to identify and develop assays for novel biomarkers, thus expanding the market’s future potential. Infectious Disease Immunoassay Market Opportunity: High Growth, High Impact:Infectious diseases require fast and effective detection for proper outcomes, and immunoassays are as important as molecular-based technologies in testing for these diseases. Common infectious disease immunoassays performed in central laboratories are typically categorized into groups such as hepatitis, retroviral testing, sexually transmitted diseases, TORCH, and other infectious diseases. Infectious disease immunoassays are used in point-of-care setting or when rapid testing is needed. Immunoassays are also used to screen blood and blood products prevent transfusion-transmitted infections. Kalorama’s report on infectious disease immunoassays notes that revenue growth rates on infectious diseases were near 4.8% for infectious disease based tests, and 3.6% for the overall immunoassay market. In terms of the market , infectious disease immunoassays beat the overall IVD market in terms of revenue growth. The healthcare market researcher said that infectious disease immunoassay market is large because of the many different infectious agents affecting the population. There are over 40 types of tests listed in the Kalorama’s recent report, The World Market for Infectious Disease Immunoassays. Point of Care Immunoassays Market Opportunity: Rapid and Portable:The market for immunoassay testing can be defined in three markets: Central, blood screening, and point-of-care. The central lab-based immunoassays market is by far the largest segment, with a 70.6% market share in 2016. Centralized laboratories include reference laboratories (such as Laboratory Corporation of America or LabCorp, Quest Diagnostics, and others), hospital laboratories, laboratories operated by health maintenance organizations (HMOs), and other centralized laboratories. 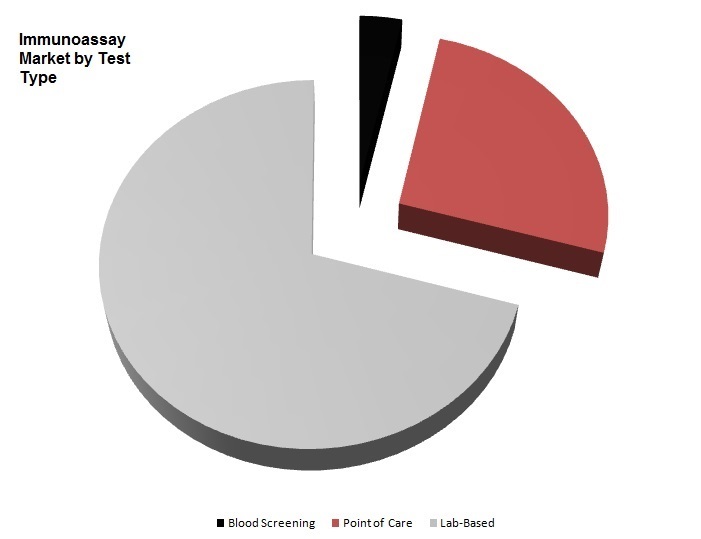 The immunoassay market’s smallest segment is blood testing (blood screening), representing just 3.5% of the total market. In developed countries, all units of blood and blood products are already screened for several infectious agents. Changes in the numbers of units donated and screened fuel blood testing’s growth in developing countries. The point of care testing markets consists of two segments: self-testing (over-the-counter or OTC segment), and professional POC testing. However, there are many locations where POC testing can occur within these segments, especially the professional POC market. Professional POC testing is performed in a number of different settings, such as hospitals, physicians office laboratories (POLs) and clinics, retail clinics, and many other locations. 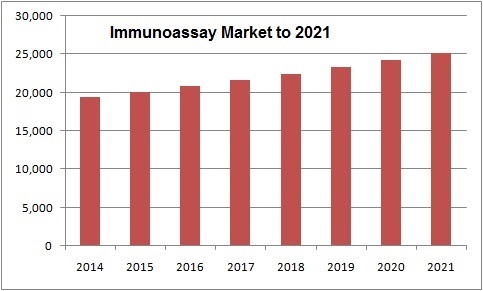 While the POC/rapid test segment represented only 25.9% of total world immunoassay sales in 2016, it is the immunoassay market’s fastest-growing segment. Point of care/rapid testing is expected to grow to 27% of the total immunoassay market by 2021. A Final Note: This curated page attempts to outline the scope of the immunoassay market. Because the market is worth billions of dollars and has competitors both large and small, this page does not represent a complete market perspective. Each disease and technical segment of the market requires an understanding of the market’s drivers and limitations, its competitors, and its future prospects.The Kalorama Knowledge Center is the best solution for acquiring knowledge on the overall immunoassay market, and contains the entirety of Kalorama Information’s years of dedicated investigave research. It is common for organizations to use substantially more content from Knowledge Centers than from individual purchases. Please contact your representative regarding this solution.